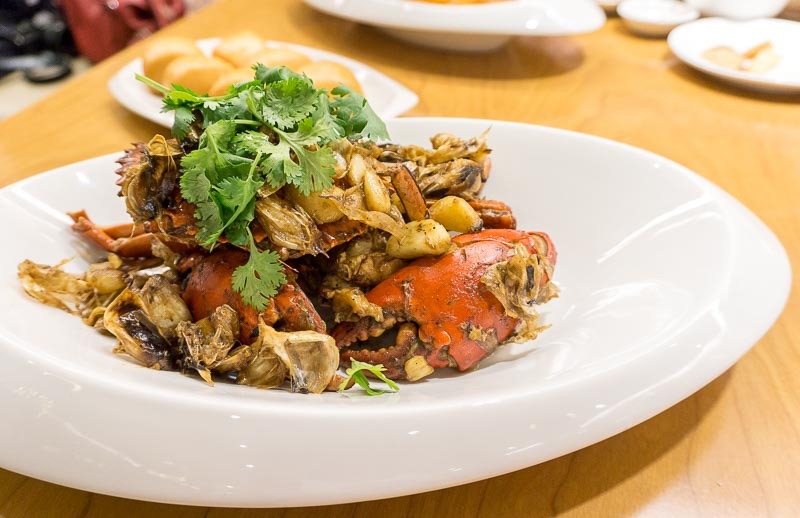 We’re all familiar with New Ubin Seafood‘s tantalising zi char for reunions with friends and family. 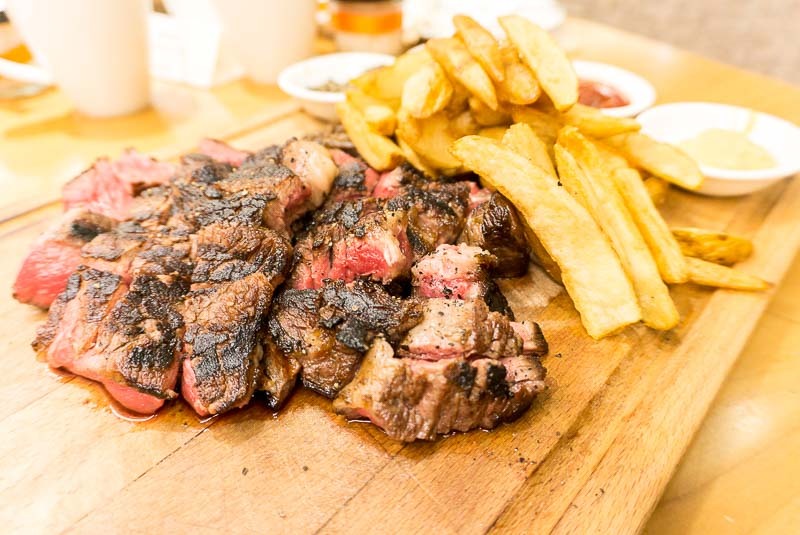 Now, you can make your gatherings more atas with New Ubin Zhongshan Park, their first foray into the hotel restaurant category. 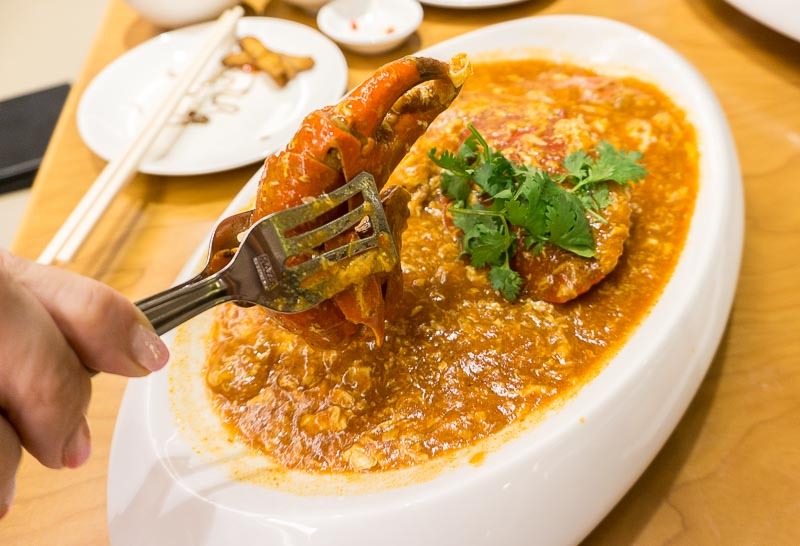 This third New Ubin outlet sees its new home in Ramada by Wyndham Singapore at Zhongshan Park serving up mouth-watering zi char dishes. 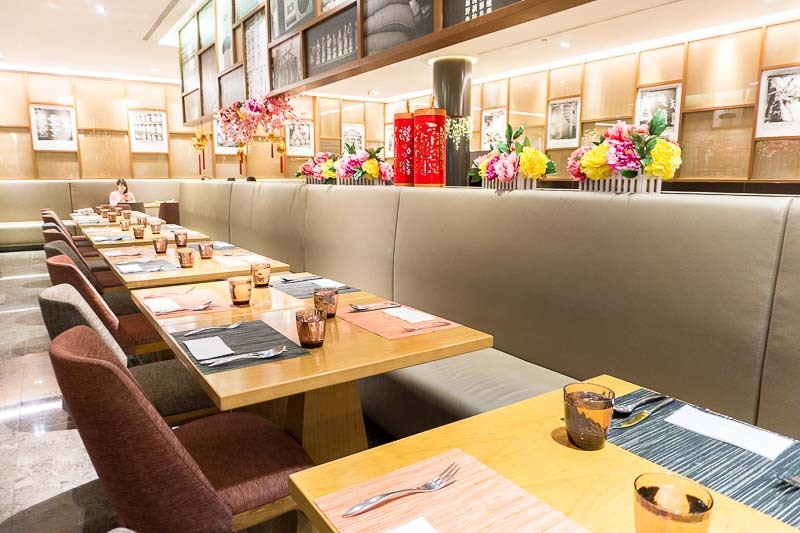 They offer diners a truly Singaporean experience with local flavours, surrounded by a comfortable and plush setting. 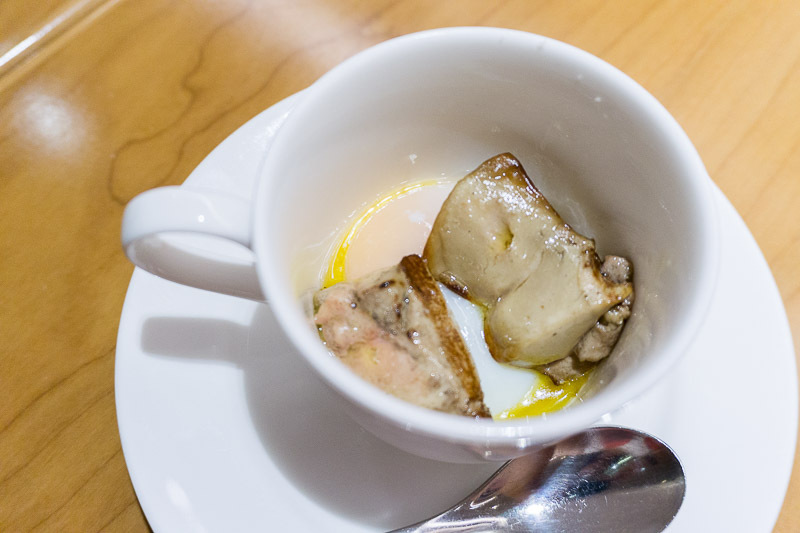 One of their more unique offerings is the Foie Gras Egg Special (S$10.50). 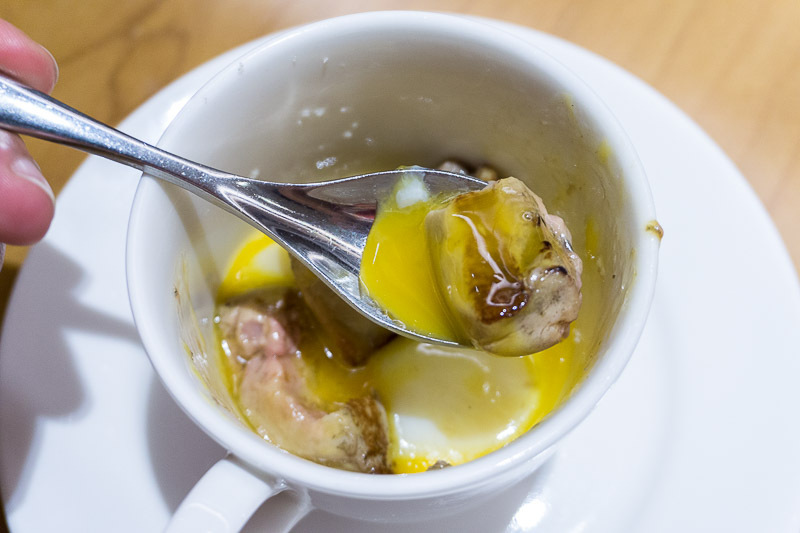 Meant to remind one of the traditional local soft-boiled egg breakfast that you’d get at a coffee shop, this dish is made more luxurious with the addition of foie gras. The truffle salt made this dish opulent on the palate and also decadent on the nose. The texture was viscous and thick, but not overly cloying given the miniature portion. Any larger, it might’ve proven too much. 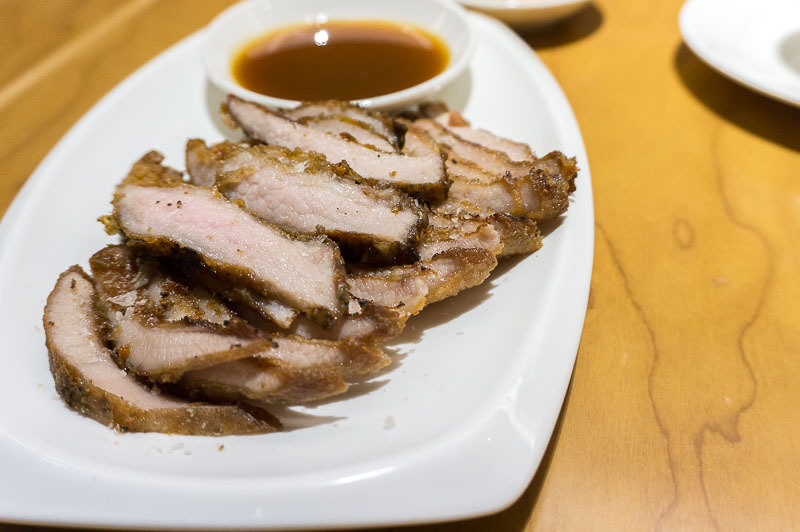 The Crispy Pork Jowl (S$14 for 125g) was adequately tender and looked very inviting, but sadly there was nothing remotely crispy about it. I was glad to taste that the miso gula melaka glaze wasn’t too strong. Anything too saccharine for this dish would’ve been overpowering, given its thinly-sliced servings. Asians are notoriously known for their love of fresh seafood. 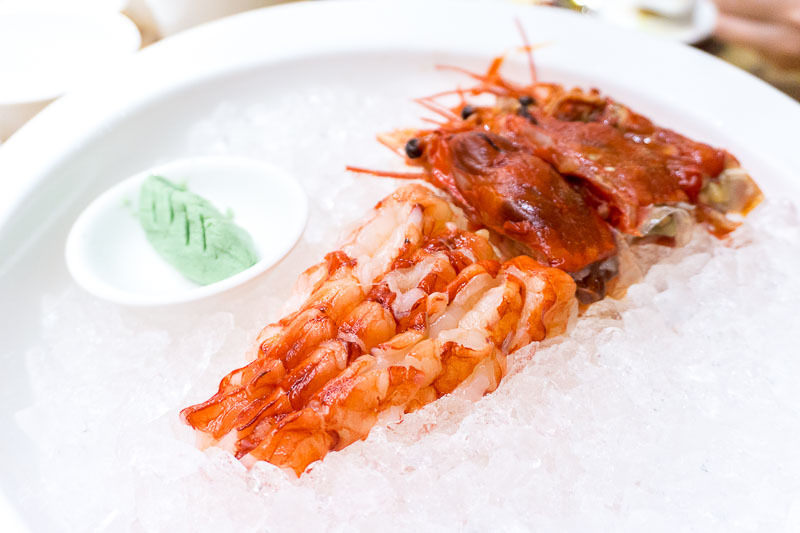 Here, New Ubin has the much-lauded Carabinero Prawns (S$22 per prawn). These are highly-prized for its intense flavour, especially the juicy contents from its head. I typically chuck aside the head when I enjoy large prawns, but I had to find out for myself what this intense flavour was all about. It was a mix of briny, savoury and umami, the kind of potent essence that you could very well use as a solid foundation of a broth or gravy. I was admittedly apprehensive about trying the Fish Roe With Sambal Chinchalok & Petai Beans (S$25), given the petai (stink beans) in it. But hey, it’s smothered in fish roe and sambal chinchalok, so I thought it couldn’t be all that bad. Surprisingly sweet and sour, it had a mild tanginess that proved to be more addictive that I’d initially anticipated. 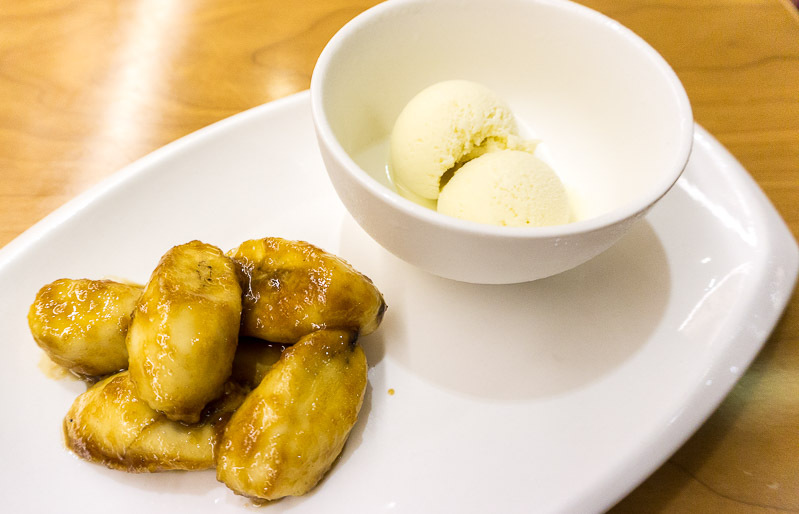 I was shovelling small scoops of this on my plate throughout the evening, and I ended up stealing the “paiseh piece”. 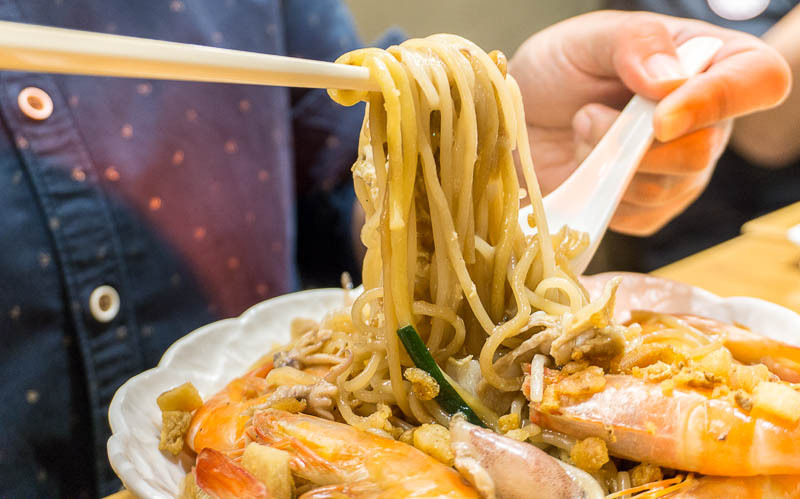 Their Hokkien Mee Special (S$15 for small, S$30 for large) was a mountain of yellow and white noodles, peppered with copious amounts of pork belly, clams and baby squid — very different from what I’m used to seeing. 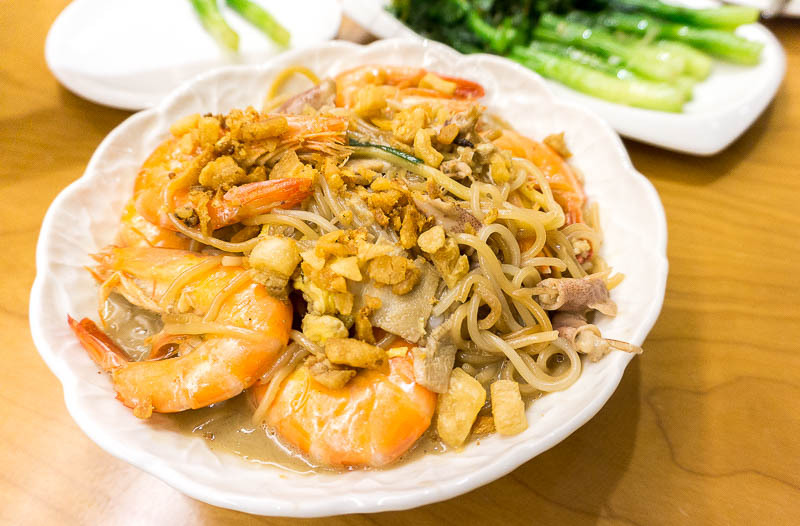 The pork and prawn broth was gao, with rich flavours infused into the noodles. I would’ve eaten much more of this if I wasn’t trying to save space for the seemingly endless stream of dishes! 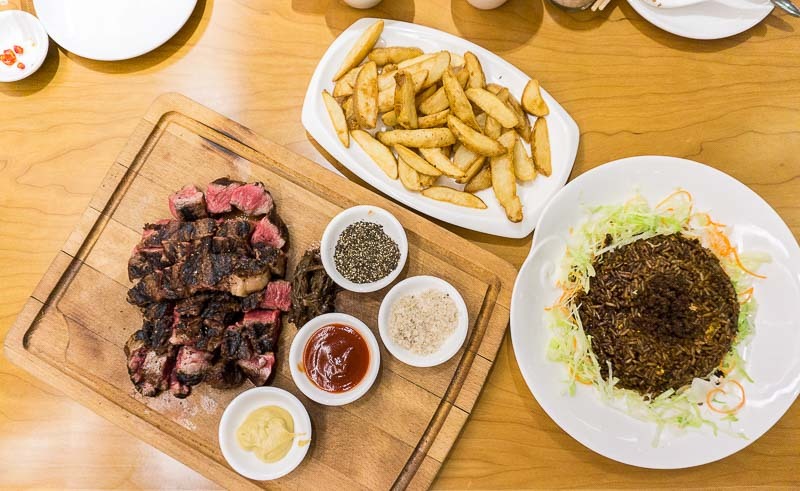 There’s more than just zi char here, and the USDA Black Angus ‘Choice’ Ribeye (S$16 per 100g) is one of the menu highlights. Served with ‘heart attack’ fried rice (with beef drippings) and wedges, we had it medium-rare. I like my beef incredibly tender and with a slight bite, but this one didn’t really meet that expectation. It had an oddly tough exterior, with a bright red centre that was chewy and not very flavourful. 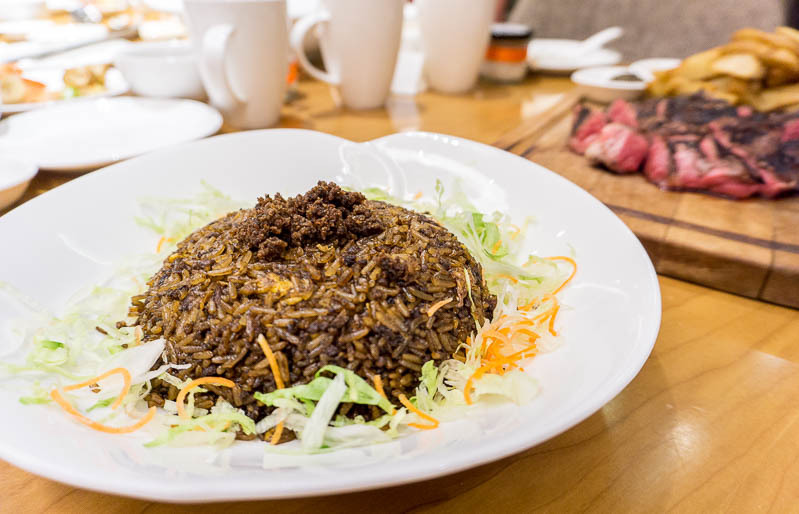 The ‘heart attack’ fried rice, on the other hand, had a nice savoury and buttery coat that made me wish it was a feature dish instead. Perhaps throwing in cubes of beef in there would’ve made more sense, instead of leaving the steak on its own. 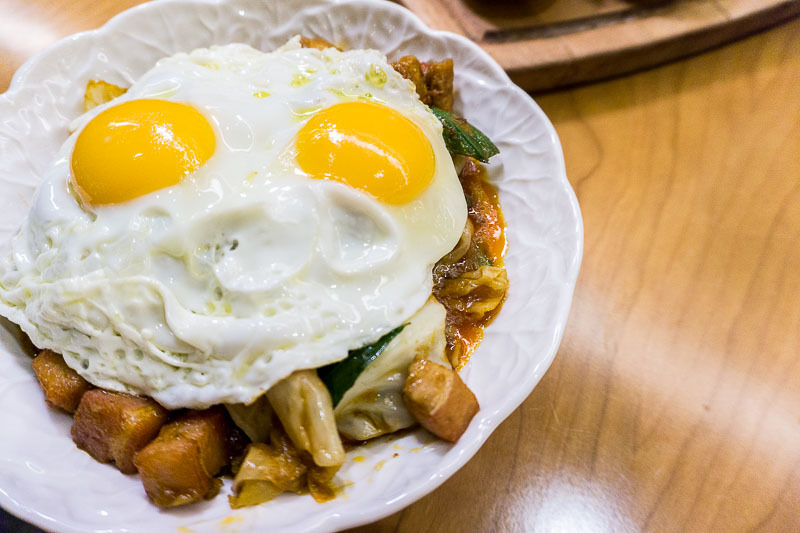 Be sure to make room for the Smoked Pork Curry (S$29), which came with lady’s fingers, cabbage, eggplant, fried bean curd, and of course, house-smoked pork belly. The dish looked underwhelming, but was actually really gratifying after each spoonful. What I enjoyed most wasn’t just the myriad of ingredients, but it was also the subdued sweetness of the curry itself. 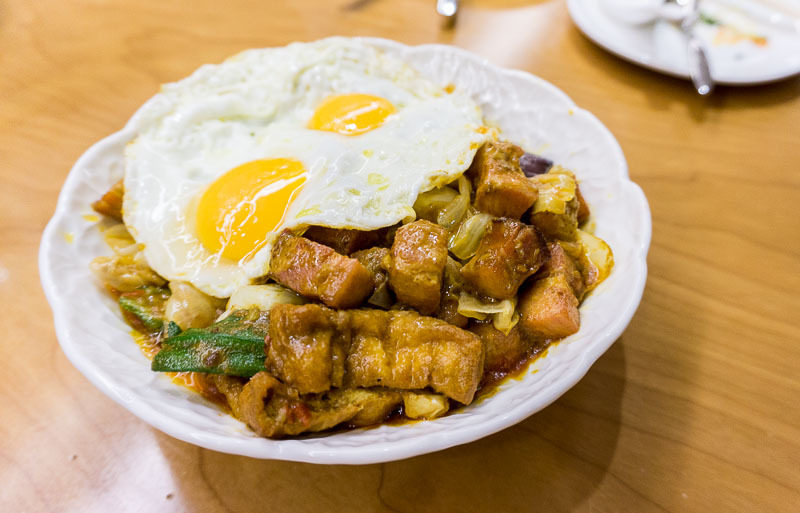 It felt like a very hearty one-bowl dish that you could enjoy on your own, even without rice. Once you commit to finishing this, you won’t feel the need to fill up on much else. 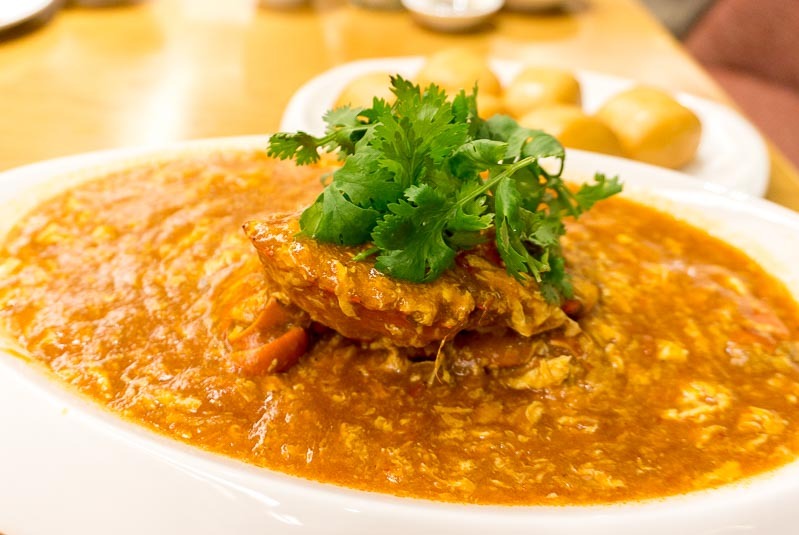 What’s a visit to New Ubin Seafood without ordering their Live Mud Crab (S$48 per 500g) cooked with Classic Chilli? You can add on Deep-fried ‘Man Tou’ Buns at an additional S$4 for three pieces. The gravy was thick and heavy, with an almost syrup-like quality when I scooped it up. Taste-wise, however, it leaned too much towards tomato paste and proved to be quite acidic. There wasn’t enough spiciness, which was a shame, given the crab meat was really succulent and sweet. I’ll stick to my regular chilli crab place, thank you very much. Want to try a different sauce? Have your crab done Garlic Baked instead, because this was a version I loved! Whole cloves of baked garlic cloves are piled high on the plate, and they’ve been rendered down till they’re incredibly soft and caramelised. Trust me, you’ll either want to eat all the garlic cloves, or you’d be tempted to bring them home so you can repurpose them for another recipe (which the chef actually insisted we do)! I thought I was already bursting at the seams by the time we finished the savoury dishes. But you know me, there’s always room for dessert. Plus, I can’t pass up anything that has bananas in it. Their Banana Gula Melaka (S$10) did the trick of cleansing my palate by cutting through the grease and rich sauces with its sweetness. Needless to say, I wolfed down this dessert unapologetically. 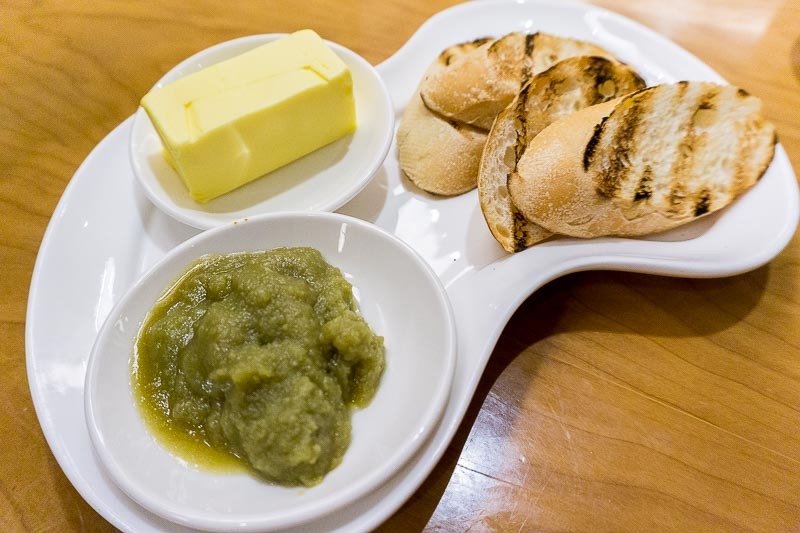 Kaya toast is usually a breakfast item, but here, it’s a dessert that’s served with a mini block of butter. Their Kaya On Toasted Baguette (S$8 for five pieces) features homemade kaya with nicely charred baguette slices. What really surprised everyone at the table was the hunk of butter that came with it; the portion was a bit extra if you ask me. Overall, it was nothing to write home about, and I don’t personally see the appeal of ordering kaya toast as a post-dinner snack. There were definitely some hits and misses throughout the evening, though I really couldn’t get enough of some dishes. Would this place warrant a re-visit from me? Probably not, simply based on location since I don’t frequent the area. And for similar favourites, I could probably seek them out elsewhere for cheaper and better. 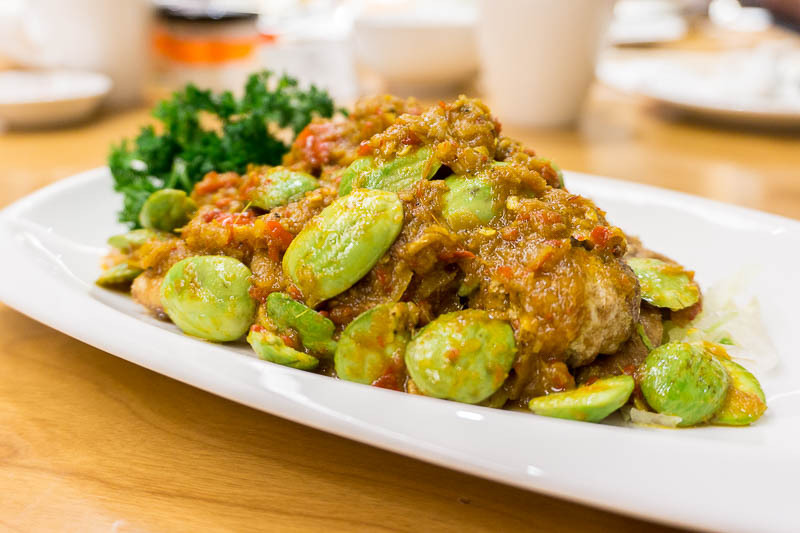 But to each his own, and who knows, you might find New Ubin’s latest restaurant a worthy addition to your list of must-visits.